Getting Off The Grid. Great for Adventure Lovers! Fishing enthusiasts have long understood the benefits of visiting remote locations. Although the lodging at fly-in camps may be off the electrical grid, the setting meant a better experience. Now, other adventure lovers can have an off-the-grid experience and without the cost of a flight. 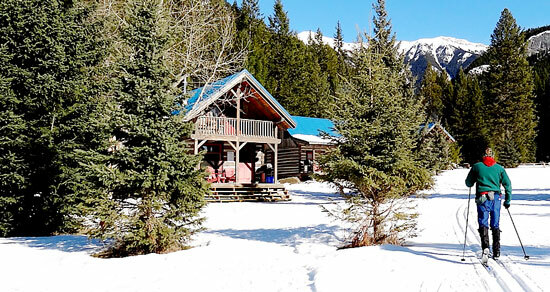 Nipika Mountain Resort in southeast British Columbia is a scenic four-hour drive from Red Deer and offers premium cross-country skiing and mountain biking conditions with space to roam. Nipika was the brainchild of Lyle and Dianne Wilson. A former coach with Canada’s Olympic Cross Country ski team, Lyle discovered the location that would make his dream of a resort a reality, while out skiing in 1979. 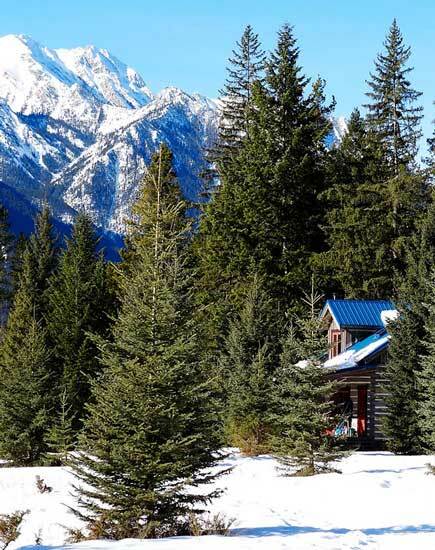 Dianne and Lyle bought 144 acres of this land adjacent to Kootenay National Park and started creating trails and adding buildings. The result is an eco-resort with several cabins, a conference centre and day lodge, all developed in harmony with the natural environment. Most of the buildings and furniture at the resort were built from wood killed by the mountain pine bark beetle. 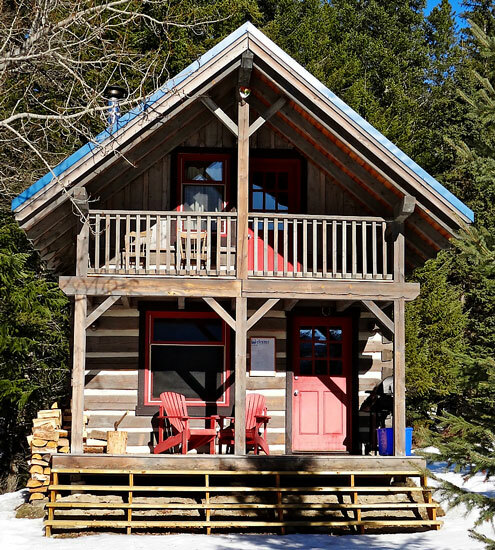 The Nipika Day Lodge is a recycled building. Lyle found an old farm building near Golden and took it apart, labelling each piece of wood so it could be rebuilt in its original form. Gazing at the solid wood beams, I could see no signs of mechanical cutting, everything was hand-hewn when these trees were felled. The building is now used for waxing skis, and trail orientation. It was a luxury to leisurely apply wax to my skis while my toes stayed warm. Usually, I shiver and quickly slap on wax in a parking lot. That same resourcefulness was needed when it came time to turn on the lights. With no access to conventional energy sources, the Wilsons explored alternative energy sources. “Wind technology nowadays would probably work, but when we started, there was not enough wind in the area to power the resort,” says Diane. Instead they installed solar panels to collect sunlight and batteries to store power for later use. You cannot plug in a hair dryer at Nipika, but it should not be a problem since you will find yourself wearing a bike helmet or ski toque much of the day. Water for coffee is boiled on a stove, not brewed in a coffee maker. Disconnecting from the wired world is probably the hardest change, but rumour has it, that if you wander around the main reception area you might pick up an occasional wi-fi signal. With over one hundred kilometres of trails, you can ski for hours and see far fewer people than in a provincial or national park. In the summer, the same trails are popular with mountain bikers and equestrians. There are no horses on the property, but riders are welcome to bring their own. Motorized vehicles are not allowed on the Nipika trails or the neighbouring Cross River Canyon Recreation Site, making it a great place for self-propelled adventure lovers. As I explored the area, the stillness was broken only by the sound of skis slicing through the snow, and I realized it was a wonderful place to renew a soul that spent too many hours on the grid! If you decide to go, visit www.nipika.com for more information.